Cut Off Wire – cut slabs clay off the block, remove pot from bat or wheel head. Synthetic Sponge – for smoothing surfaces and rims and removing water from thrown pieces. Wooden Rib – assists in throwing cylinders, smoothing walls and shaping pots. Pearcore Trimming Tool – makes quick work of trimming pot foot and exterior clean up. Wood Modeling Tool – for trimming, sculpting and more. 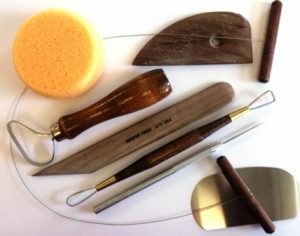 Double Ended Ribbon Tool – for finer trimming on pot foot and rim. Needle Tool – (some call it a pin tool) for testing thickness of bottoms of pots, cutting off uneven rims, scoring and so much more. Steel Scraper – smooth and burnish surfaces. See some of these tools at work on our tutorial video.